Bear in mind, the internet predicted the death of print, yet print sales are up year on year, and younger generations are driving the trend. The only guarantee with predictions is that they’re usually completely wrong. It’s the same in this case. That’s because as usual, the predicted death only applies to the bad press release. Sure, the press release has evolved, but it’s still as useful as ever, and a lot of these transformative changes have made it a stronger tool in your business’ arsenal. Don’t get me wrong, the very purpose of a press release has undergone multiple transformations. At first it was about contacting journalists, then there was a time when it was a boon for SEO. Now, it’s a direct form of PR that forms part of a wider, omnichannel strategy. 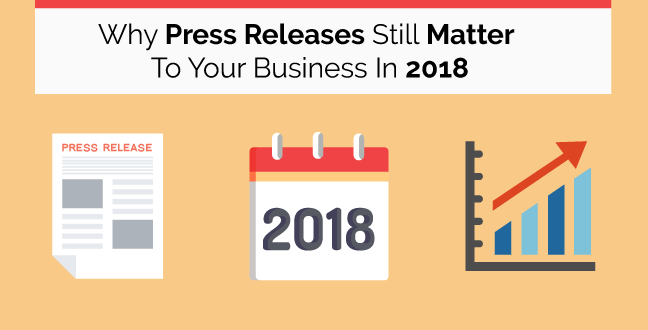 Today, we’re going to look at what are the new uses of an online press release in 2018, and how you can take advantage of them. To some of you wondering where to begin. Something newsworthy. You might hear this thrown around a lot, but let me break that down into a more comprehensive definition. Let’s look at the dictionary definition: noteworthy as news; topical. Synonyms include interesting, topical, notable, important, significant, momentous, historic, remarkable, sensational. You’ll notice these get more exaggerated as they go along. It’s worth thinking in terms of the back half of the list above instead of the first half. News is crowded out. Progress is faster than ever. People consume more information than at any point in human history. As such, the bar for what constitutes newsworthy has been raised. How do you get there? Any PR business worth its salt will be able to help you craft compelling angles on your current events and developments, but this is an expensive investment for SMEs, and the instinct to try and do it yourself is strong. As such, here comes the quickest guide you’ll find to how to think about a press release like a PR pro. Three-quarters of the word news is “new”. It’s always worth bearing that in mind. If anything happened a month ago, it’s too late to write a press release about it. If something happened today, it’s too late to write a press release about it. If something is happening tomorrow… you guessed it, it’s too late to write a press release about it. If you have any hope of having your story picked up, you need to give them lead time. Tell them about what’s going to happen. Be strategic. So, new and upcoming … something. But what? Products: it’s the iPhone Z! Services: We can now fix an iPhone Z! Executive Hires: Apple hires Bill Gates! Expansion: Apple creates new HQ in China! Events: Apple hosts Fan Festival! Now you know what kind of topics and what kind of timelines we’re talking about, make the most of that subject and get it out front. A snappy headline that can sell journalists on the angle for their piece, a summary that describes the story in full in a sentence, and all the most important information up front in the first paragraph. Follow that up with some context and a quote, and you’re golden. That’s the shortest guide to writing a great press release I can give you. But I understand, you want to know whether it’s even worth wasting your time reading this section, so here we go. A press release confers a broad range of advantages for your business, and remains an essential way to frame the conversation around your brand. 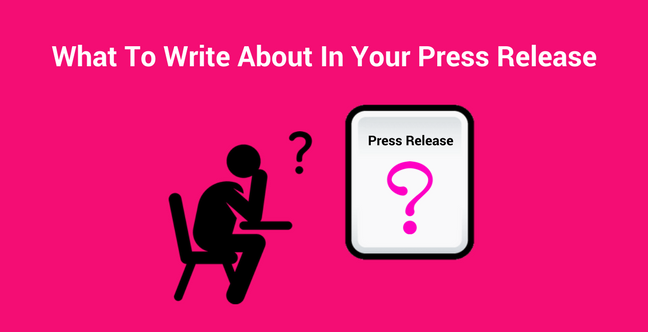 Think of the press release as the picture frame for the rest of your PR campaign. A quick word of warning, though: a Press Release might do wonders for your business, especially when written and distributed by a Press Release Service, but ultimately a press release isn’t for your business. It’s for journalists, and by extension, the public. Always keep in mind that it’s not designed to flatter your business, it’s designed to help others talk about it in an informed manner. Press releases are still the most trusted way of announcing your developments to others. Using newswires, you can get premium distribution on high-authority websites, which offer you the best possible way to raise awareness of your business and its existence. There’s no point doing great work if nobody knows about it. Press releases are a fast, efficient way of getting your name syndicated across Reuters, CNN, FOX, and so on. What’s more, you can make sure you target the newswires you use by industry and locality. Even if you target individual journalists (and you should), having the press release listed on official newswires will help them accept that your business is for real. What’s more, it’ll be a reminder that your story is out there, and that other people might have seen it. A press release is a single, ~400 word one-pager that is packed tight with impactful news, clever ideas, corroborating facts and information, context and a compelling quote about the mission and vision that led to this development. You should have stopped reading at “~400 word one-pager”. It takes relatively little time, especially for an experienced writer, to generate a high-quality press release. It takes very little money to hire a writer and get that PR distributed across a huge number of sites. Once it’s distributed, it’s there for everyone to see, search, discover. Putting out press releases will help you create a timeline of your success, and a trail of breadcrumbs back to your business website. It’s for this reason that press releases remain popular with startups and SMEs seeking investment. Every PR ends with a boilerplate, a 70-100 word summary of your business. It contains contact details for journalists. It talks about your business, the journey it’s been on, and the latest steps its taking. Where else can you find this business profile presented as concisely as this, all over the internet? If anyone needs to understand your business quickly, a press release will give them everything they need and more. Let’s say you have a potential client who receives your pitch. They Google you. Do they find your website and that’s it, or a litany of news dating back months, even years, that demonstrates a proven track record of quality and innovation? The result of getting information rich, impactful news stories inexpensively distributed to build your business credibility is, of course, a big positive upswing in how your company is perceived. If you’re more professional, more dynamic, and better recognized, then this will lead to new opportunities for your company both with customers and with potential business partners. The best thing about a press release is that you maintain total control over the story. Creating a press release that is pretty much the finished article is a great way to save journalists time in meeting their content quotas. What’s more, it’s a great way to ensure your products and services are talked about in the terms you dictate. This is a PR pro’s dream in the digital age, when businesses threaten to be sunk by negative reviews. The beauty of search engines is that they search everywhere, including newswires. If people are searching for the right terms, and you’ve included these in your PR, the “Top Stories” section of Google will often be featured ahead of the main search results, giving you a way to circumvent the typical rankings and increase exposure. With this comes customer engagement. If people find your PR in a newswire, it serves as an introduction to your business. A quality press release should do as much of the work for a journalist as possible, so the angle is clear, the information present up front, with a quote from a spokesperson to humanize the brand. All this stuff is proven to increase engagement from real customers (which is why you want journalists to feature it in the first place). When readers find out about the work your business is doing, they are bound to want to check out your website, generating leads which you can then convert into prospective customers. Thanks to dissolving barriers between readers and information, more people than ever are getting news directly from the source – even tweeting a link to your Press Release with relevant hashtags allows you to gain new followers. Press releases offer you a consistent, strategic way to present your successes to the world. Every development, expansion, new product introduction and more can sell the story of your success not just to potential investors, but to customers too. The more professional and successful your business appears, the more confidence consumers are going to have in making that all important first purchase. Once you’ve made someone into a customer, regularly reminding them of your brand via the most exciting developments in your company is a great way to maximize customer lifetime value, encouraging warm followers to return to your business to see these new developments for themselves. While Google has determined that press releases are now “rank agnostic” in terms of actually increasing SERP rankings through their backlinks, there are still many advantages to a press release as part of an SEO strategy. These advantages are simply indirect as opposed to direct, but no less potent for it. Optimized press releases still enable you to create natural links from outside sources, building backlinks and site authority from those sites that syndicate your press release or write an article based on it on other sites. Press releases increase your visibility and name recognition through brute force – there is no easier way your brand name repeated that many times across that many online press release sites. Finally, this all leads to an increase in referral traffic, where more real users are more likely to visit your website. Writing your press releases with SEO keywords in mind is therefore still part of the best practice for PR writing. What Do I Do Once I’ve Got An Idea For A PR? Write it up! If you feel like there are too many criteria to balance, and writing isn’t your strong suit, the smartest move is to let a professional writer draft your PR based on a brief you provide. Running your own business comes with many challenges, and one of the most important to master is knowing when to delegate tasks. A professional writing service can help you get press releases quicker and better than you could likely put together on your own. 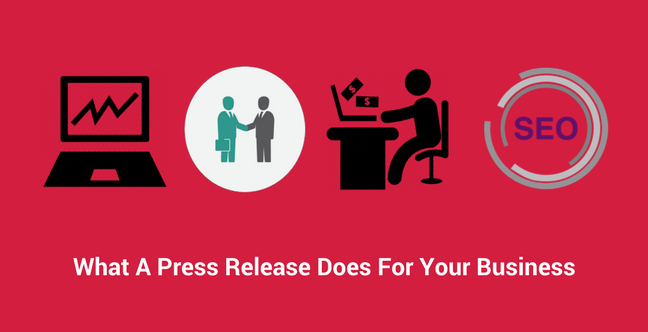 Once you have your PR drafted, it’s time to take it to a press release distribution service. Fortunately for you, that’s us! 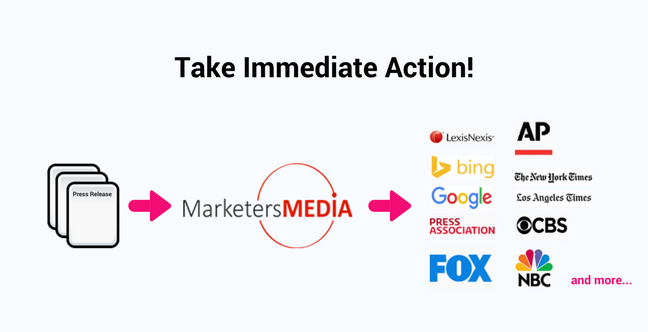 MarketersMEDIA can help you distribute your press release to as wide or as targeted an audience as possible, through newswires with hundreds of high authority websites, news aggregators, local news media outlets and more. You can select your preferred distribution, and even get your PR written up by our team of professional writers. With the right message, you could win customers and present yourself as an industry expert in the process, creating legacy benefits for you and your business. When you release a press release to targeted markets, your chances of a feature increase dramatically. Have you had success with online press releases? Tell our readers in the comments below. Do you have any questions about our press release service? Feel free to ask, and members of our community can explain everything. Winnie is an aspiring copywriter in the world of internet marketing. Everything is new to her but she's as curious as she can be; constantly hunting for answers to her questions. When she's not spending her time typing up a storm, she is at home keeping up with her never-ending movie marathon. Copyright © 2012 - 2019	MarketersMedia Blog. All Rights Reserved.